Star Plus new Colors with new shows – interested? Colors TV has left many TV channels color-less with its top notch Balika Vadhu and otherÂ TRP hoggingÂ programming. Guess what? Star Plus is feeling heat thisÂ summer and trying all new colors with launch of new shows. As expected, titles are long, mushy mushy stuff in the offering. Line up includes: Ye Rishta Kya Kehlata Hai [9:30], Sabki Laadli Bebo [10:00] and Chehra [10:30]. 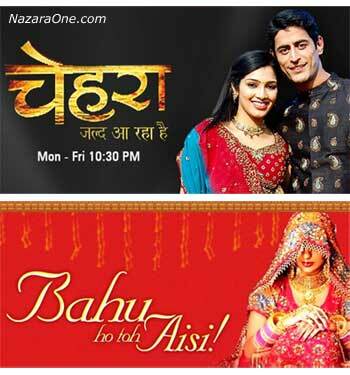 These shows have started on the channel and their lot many coming soon on the channel like: Star Vivaah – Bahu Ho to Aisi. Get on the couch and see Star Plus’s new colors – lets see if these shows bring more color as colors TV is also launching new shows left-right-center. With 9x channel already given up (sort of) and Sony still stuck with season runs of reality shows – things look all setup for Star Plus and Colors. i lv the star girl ov chehra girl…..she z so pritty……..live long n successfull. i lv the star girl ov chehra serielâ€¦..she z so prittyâ€¦â€¦..live long n successfull.